The February meeting of Muse and Views was held at Colette's home, with Betty hosting. Lovely wines, hors d'oeuvres, and Joe's fresh cinnamon buns and coffee warmed us up on a wintery evening. Betty, Carla, Janet, Shirley, Colette and Jolene attended. 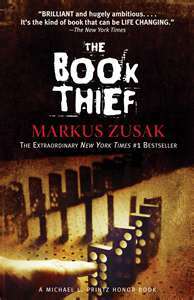 We discussed The Book Thief by Marcus Suzak, Betty's choice and a real hit with most of the group. Betty had not read the book beforehand, but was pleased with the choice, suggested to her by a friend from another club. Betty gave us some background on the author, who was born of an Austrian father and a German mother. Their lives helped inspire the book; in fact, the loveable Hans Huberman was a house painter like Suzak's father. Another detail of interest was that Suzak's dad had been forced into the Hitler Youth program as a young person. Suzak wanted young adults to get a different perspective of the Holocaust and to try to find beautiful moments in ugly times. He was surprised by the success of the novel, which won a Michael L. Printz award. (What a great surname for someone in the literary domain!) The book was originally published as adult fiction in Australia, where the author's parents had emigrated after the war. Several commented that they were surprised that the book has been classified locally as teen or young adult fiction, no doubt largely because it is a coming-of-age story. Another theme of the book was the power of words, whether the power of Hitler's words to inspire hatred, or the power of Leisel's oral reading to bring encouragement to townspeople during difficult times. The narrator of the story was Death, and most found this interesting. The perspective of a German child was also appreciated, since we often see the Holocaust from an adult, Jewish viewpoint. All but one found the characters very well described, with even foul-mouthed Rosa endearing because of her good heart. The only real criticisms were that the book was sometimes difficult to follow, with so much jumping around, and that a better explanation could have been given as to why Rosa and Hans would want to foster the child of a communist in Nazi Germany. In the end, however, all were glad they had read the book, and some said they might not have to read any further to decide on the "Best Pick" of the year. A small negative aspect of being out of country is that I missed the meeting of the Muse and Views Book club that I always enjoy. This book was a very good read. I found the images that it created in my mind to be very vivid and in some cases such as when Rudy is beaten by the chief of the Nazi Youth group difficult to endure, I had to put the book down (my Kobo) for a few days. I am not sure I would have been able to read such a book as a teenager. We have read several books that take place during or recall World War II experiences and in my opinion, none allowed us to see the compassion ordinary German people had for those who suffered under Hitler's rule as much as this one did. Certainly as we witnessed in Schindler's List there were some extraordinary feats accomplished to save some Jews and others persecuted by Hitler but this story reveals, I believe, that ordinary citizens did not all believe in Hitler's propaganda. They may have felt they couldn't speak out but they acted compassionately as much as they could. The Hubermanns, Rudy, Liesl and the Mayor's wife all gave us a different side of the German ordinary citizen then what we tend to read or hear about in general. As to why the Hubermanns decided to foster Liesl and her brother, I believe that it was probably originally for the money they received from the State. And the State, for them putting these two kids into a good German family while jailing the "communist" mother was a way of bringing two pure German children back into the Nazi fold. This story though bleak has many inspiring aspects to it. The Hubermans' humanity and the transfer through their action of that to Liesl; the recognition by Hans of the importance of books and reading; the small bit of joy that Liesl brings to the Mayor's wife and the determination of Rudy not to be indoctrinated by the Hitler Youth group. Of all the characters in this story, I think that Rosa was the most surprising and endearing. We certainly originally saw her as a bad-mouth sour woman, you can see her original personality that probably made Hans fall in love with her come out as the story evolves and their lives become more desperate. Great choice Betty, thank you. This book was voted our best book club read for 2012. The prize was given to Betty in January 2013.